After three months of missed deadlines and failed safety clearances, the country's first private metro rail line, Airport Express Line, is set to begin operations here next week. The Reliance Anil Dhirubhai Ambani Group's Delhi Airport Express Pvt Ltd (DAMEPL) would run and maintain the line, which would reduce travel time between the heart of the capital and the Indira Gandhi International Airport to 20 minutes. The government-owned Delhi Metro Rail Corporation had bid out the line to the Reliance company on a public-private partnership. DMRC laid the track and built the civil structures, beside supplying the rolling stock. The line had failed to get safety clearances owing to technical glitches during an earlier inspection by the Commissioner for Metro Rail Safety (CMRS) in late September. "The new dates for the second inspection by the CMRS are Friday (January 7) and Saturday. Once the safety clearance is obtained, it will take less than a week to open the line for the public. In all probability, the line should start next week," said a senior official from DMRC. "Although we have carried out our own inspections before inviting CMRS, the safety commissioner's inspection deals with the statutory requirements of safety and other standards." An issue that still remains to be resolved for the smooth running are differences between the concessionaire and the various airlines over setting up check-in counters at select stations on the line. "It is a commercial issue between the concessionaire and the airlines. It is yet to be resolved. But at least Air India will surely do it (set up check-in counters)," the DMRC official said. Airlines are reluctant to pay rental charges for the check-in facilities at the metro stations. Negotiations are on. The official said the ministry of civil aviation is pushing for early opening of the line, to benefit passengers. "The ministry is very keen to resolve the matter. In fact, the secretary, civil aviation, has set up a committee to look into the issue. It is still working on it." Air India's team recently did a technical inspection of the stations and is likely to sign an agreement shortly with DAMEPL. At Rs 150, the fare for the high-speed metro is far higher than any of the other metro corridors in the city, raising doubts on occupancy. A check-in facility at metro stations is, therefore, crucial to attract flyers, who normally take taxis to the airport. The metro official said service on the 22-km line would initially be available for 16 hours daily, between 6 am and 10 pm. "There will be four stations to begin with  New Delhi, Shivaji Stadium, IGI Airport and Dwarka Sector 21. Later, two stations, Dhaula Kuan and NH-8, will be added to the line," the official said. A feature of trains on this line would be much higher speed. According to DAMEPL, a subsidiary of Reliance Infrastructure, they'd run at 120 kmph. 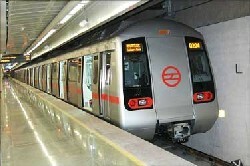 Metro trains in Delhi run at an average speed of around 40 kmph. For this, the concessionaire has been providing special training to drivers. The agreement says the concessionaire, DAMEPL, would hand over the line to DMRC after running it for 30 years.